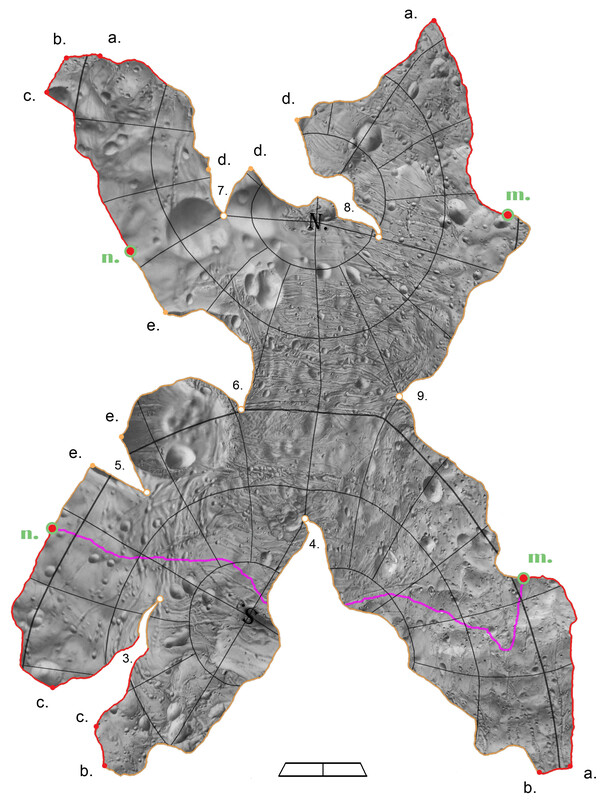 This map of Phobos can be cut out and assembled into a good three-dimensional representation of the odd-shaped moon of Mars. The map was produced through a technique called constant-scale natural boundary mapping, developed by Georgia architect Chuck Clark. 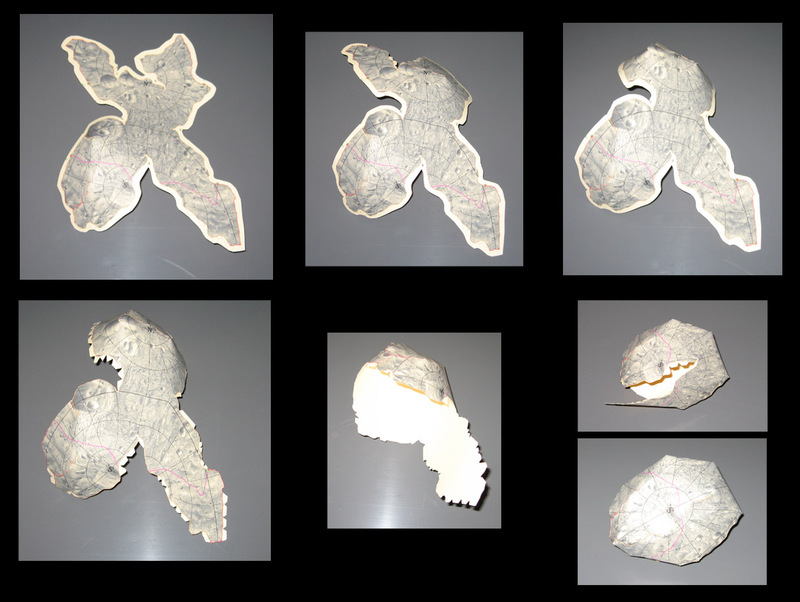 Cut out the map, leaving about a quarter inch (5 mm) of paper around all the edges. You will need to cut off most of this extra paper, but leave tabs as necessary so that you can glue or tape the edges together. Generally, it's best to leave a tab on the concave side of a seam, and cut off the paper on the convex side of a seam. To help things fold flat, you need to snip notches into your tabs, making no tab longer than about 1/2 inch (1 cm) along the seam. If you're familiar with sewing, this is usually referred to as "clipping curves." To assemble Chuck Clark's constant-scale natural boundary maps, devise a system of tabs to which you can apply glue and/or tape to hold the seams together. Start gluing together the seams. I started in the narrowest notches first, applying a little white glue to a tab and bringing the other side over and squeezing it together for 10 seconds or so with thumb and forefinger, then I applied some transparent tape on the back side for good measure. You'll have to strategize about where your last seam is going to be, since you'll no longer be able to get a finger inside the model to apply counterpressure. I found it easiest to make the last seam one of the pretty straight ones. Chuck Clark actually seems to assemble these without glue, just using a little tape here and there across the seams. To join the last seam, he recommends a narrow rod or straw be inserted through a gap antipodal to the spot you need to tape, to allow you to apply counterpressure. Here's how mine came together. I was working quickly, so it's not as neat a job as it might be, but it worked. What part of Phobos are we looking at here? I always assume unless I'm told otherwise that a view onto a world sees a relatively equatorial view, but that turns out not to be the case. Stickney -- the great big crater at left -- does sit on Phobos' equator. But until I had my model in my hand, I didn't realize that most of what is in this view is actually Phobos' northern hemisphere, and the north pole is contained in one of the sunlit craters near the right side of the image. In the photo below, I've rotated my glued-together model to match the viewing geometry. My thumb sort of traces out the terminator (day-night boundary) -- there's quite a bit of Phobos that we can't see in the Mars Express image because it was night there when the photo was taken. 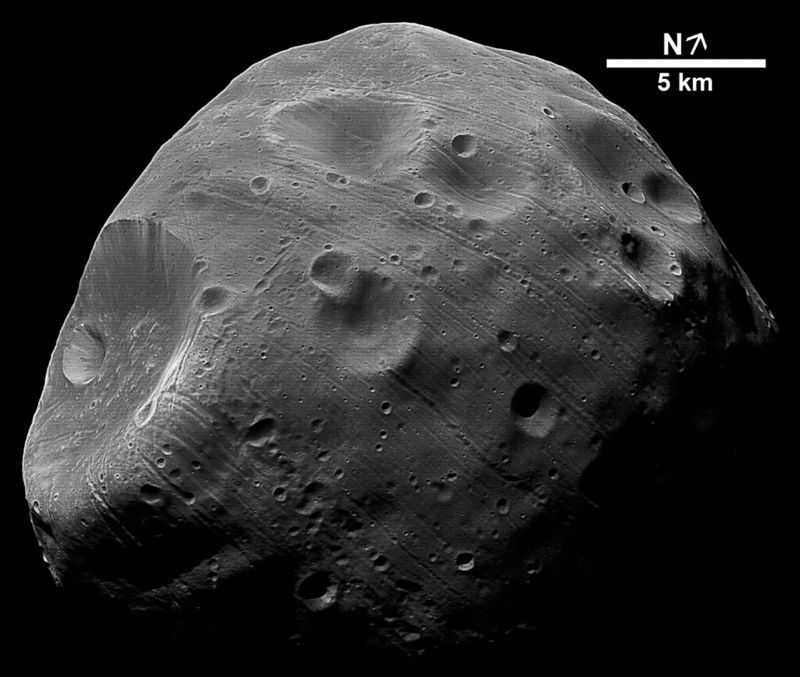 This totally does not match the mental model I had for the photo -- I'm going to have to try to keep my Phobos model from getting crushed and pull it out every time I see a new image! Here, the constant-scale natural boundary model of Phobos has been oriented to match the view from an iconic Mars Express image of Mars' moon. Clark's technique is really cool. Have a go at the map yourself, or have your kids try it out! 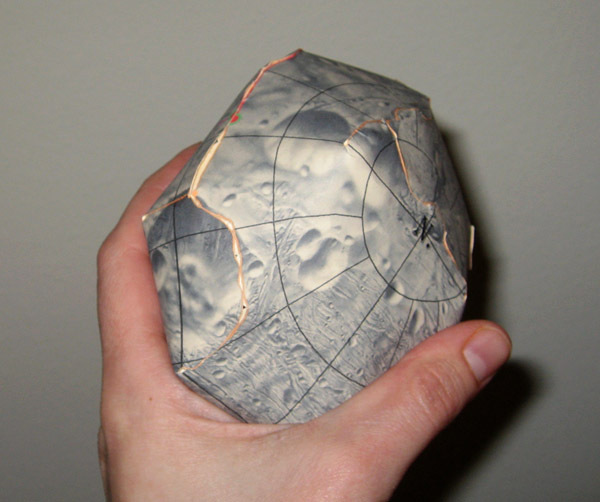 Was there also a paper model available for Deimos?